When Thomas Christensen talks about his world view, it's considerably broader -- and a lot more interconnected -- than most of ours. At least that's how it seems as you listen to Christensen discuss his literary and artistic interests. A conversation with the Bay Area author, publisher and translator can start with the link between Gutenberg and Korea, skip to the significance of Shakespeare's Caliban in Latin America and trace an iron warrior sculpture's journey from West Africa to France. Christensen's writings on these subjects and others are contained in his wide-ranging new book, "River of Ink: Literature, History, Art" (Counterpoint, $35, 320 pages). Beautifully written and designed by the author, with dozens of full-color illustrations, the book is a dazzling cabinet of wonders for anyone seeking knowledge about the wider world. "I wanted people to think globally," Christensen remarked in a recent interview in his office at San Francisco's Asian Art Museum, where he has been director of publications for 16 years. "I feel that sometimes, the connections between things have gotten a little bit lost or forgotten. But that doesn't mean they didn't exist. Time and time again, we find new discoveries that show us they were connected." Indeed, a conversation with Christensen, whose previous book was "1616: The World in Motion," is a fascinating survey of ancient art objects, rare ephemera, literary personalities and little-known historical events. Where "1616" focused on a single, albeit momentous, year, the new book spans centuries and continents. The tour begins in Asia -- West, East, South and the Himalayas -- and proceeds through Australia, Southeast Asia, Africa and Europe, before winding up in Latin and North America. Along the way, Christensen imparts a marvelous sense of how innovations develop and flow from one culture to another. The story of Don Quixote, for example, didn't originate with Cervantes, he claimed, but with a Muslim storyteller writing in Arabic. The iron warrior, now housed in the Louvre, morphed from a symbol of power to an artistic masterpiece. Gutenberg is credited with introducing movable type in the mid-15th century -- but Christensen notes that similar presses had been already in use in Korea. "You can see on the map that the Mongol Empire went all the way from Korea to Europe," he says. "All the other print technologies -- paper, ink, everything -- went from East to West, too. There's no smoking gun, and I don't say that they copied the exact mechanism. But I do think it's likely that the Europeans had heard about this and kind of re-engineered it." For every iconic figure in the book -- Johannes Kepler, Pocahontas, the writer Louis-Ferdinand Céline -- Christensen includes profiles of obscure powerhouses, such as Mughal Empress Nur Jahan; and Malik Ambar, who rose from slavery to become a prime minister in 17th-century India. And for every innovation and advancement, there are stories of grievous loss. The book's title refers to the Mongol siege of Baghdad in 1258. The invading hordes destroyed the city's Grand Library, throwing its vast collection of books into the Tigris River. Its waters ran black with ink for six months. Christensen, who lives in Richmond, is a splendid storyteller, one who has honed his approach over decades in publishing and art. An Oregon native raised in Wisconsin, he came to California in the 1970s. He worked at Berkeley's North Point Press before becoming executive editor of Mercury House, an independent literary press in San Francisco. That work, and his post at the Asian, gave him an unusual dual emphasis; he wrote and designed both "1616" and "River of Ink." His work as a translator (often in tandem with his wife, Carol) also informs the essays. He's translated works by Carlos Fuentes and José Ángel Valente, as well as Laura Esquivel's "Like Water for Chocolate." The book also has essays on Henry Handel Richardson, Horace Walpole and Charles Dodgson (aka Lewis Carroll). "I like those people who are a little oddball, a little off the beaten track," he says. Another intriguing essay recounts the strange history of Sadakichi Hartmann, a shape-shifting Japanese-American artist who constantly reinvented himself, befriending such luminaries as Walt Whitman, Jack London, Alfred Stieglitz and Douglas Fairbanks as he went. Christensen is currently writing a book about him. Talking to Christensen, it's easy to get a sense that history depends on the teller's point of view. "History is very close to fiction," he says. "It began as storytelling, with the ancient Greek historians. There wasn't much of a genre distinction back then. "Even today, history is constantly being reinvented, and we keep changing how we look at the past. And how we look at the past has a lot to do with how we look at the present and how we envision the future." The title of Thomas Christensen's wide-ranging new history of literacy refers to the Mongol siege of Baghdad in 1258, when the invading hordes killed hundreds of thousands and destroyed the city's Grand Library, described by the author as "perhaps the greatest repository of historic, scientific and literary documents of its age." They threw so many books into the Tigris River, he writes, the water ran black with ink for six months. 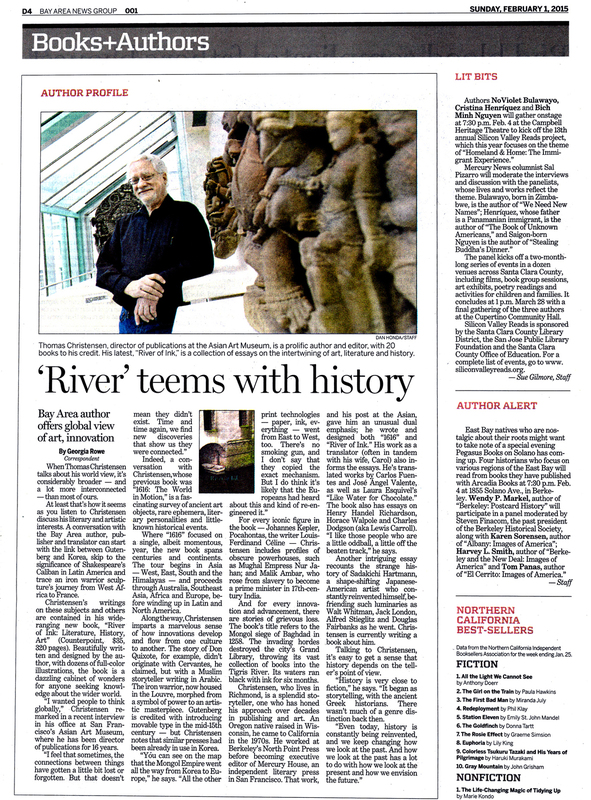 From that incident, Christensen, a Richmond resident who serves as director of publications at the Asian Art Museum in San Francisco, takes the reader on a world tour of literary landmarks from the invention of movable type in Korea to the "poetry of silence" of Spanish writer José Ángel Valente and the extraordinary tale of Pocahontas in London. The book is beautifully illustrated and Christensen writes with clarity, insight and admiration for these enduring wonders of the world. An eclectic and sporadically brilliant book in which an erudite writer takes his readers on a set of historical and cultural birdwalks. The essay "Journeys of an Iron Man," which tells the story of a 19th century Benin iron sculpture of the god "Gu" -- the god of ironworking and warfare -- is a particularly informative and engaging read. 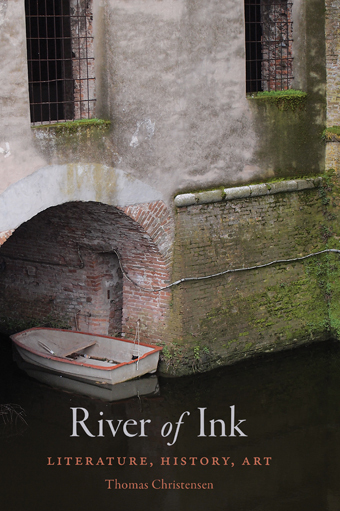 Just to say, the River of Ink is a treasure. Christensen is going to get himself into a class with Bringhurst at this rate, as a remarable humanist thinker-scholar. Reminds me that it is still possible to do some good in the world by publishing a good book! In these 30 essays, Christensen (1616: The World in Motion), a proud generalist and non-academic, addresses a slew of disparate subjects—Taoism and its influence on Chinese art, Lewis Carroll's Sylvie and Bruno, the roots of modern Turkish politics—and proves himself to be voracious reader who can clarify the present with knowledge of the past, accessibly summarize a subject, and share a fine story.... It would be difficult to read the book without learning something new.